It’s been an unexpected run for Germany’s first female chancellor, she led Europe’s greatest power through the global financial crisis, the European sovereign debt emergency and the refugee calamity. But now that run is close to being over. Chancellor Merkel’s popularity has faded quickly. Within the next 2 years Ms. Merkel will no longer be the leader of Germany. Her decline in popularity started with the refugee catastrophe. She refused to close Germany’s borders during the 2015 Syrian refugee crisis thus allowing more than 1.2 million Middle East and North African migrants to enter the country, in a period of just two years. This policy proved to be political suicide. Before the refugee crisis, the Party she leads (CDU), had for a couple of years unfailingly polled above 40 percent; today its approval is in the mid-to-high 20s, an all-time low. And it is not just the refugee crisis; the German economy is in trouble. The German economy still relies far too weightily on exports. The World Bank tells us, more than 48 percent of Germany’s gross domestic product came from exports in 2018, the highest level of any major economy. The problem is; that relying on exports to other countries is risky; if those nations slow in buying your products it can deeply hurt your economy. This is happening now; the U.S. has become more protectionist, and China isn’t buying German cars at the amount it used to. The German economy has not collapsed but it is wavering. President Trump is still holding the intimidation of car tariffs over the heads of Germany’s meticulous automakers, and it’s getting tougher to claim that the disagreements between Europe and the U.S. are only about trade and not about greater intentional quarrels. In the past year, President Trump has threatened the entire EU for trying to keep the Iran nuclear deal alive, proposed a speedy free trade agreement to allure the U.K. into pursuing a weaker relationship with the EU, suggested that France abandon the EU for its own trade deal with the U.S., ridiculed French President Emmanuel Macron on Twitter for advocating a European army, offered to buy Italy’s public debt more or less to fund its budget brawl with Brussels, and, repeatedly denounced Germany for its titanic trade surplus and its construction of the Nord Stream 2 pipeline project, which links the country to Russian natural gas supplies. Europe’s leading countries are no longer comfortable to be the junior partners in a relationship that doesn’t always serve their interests. 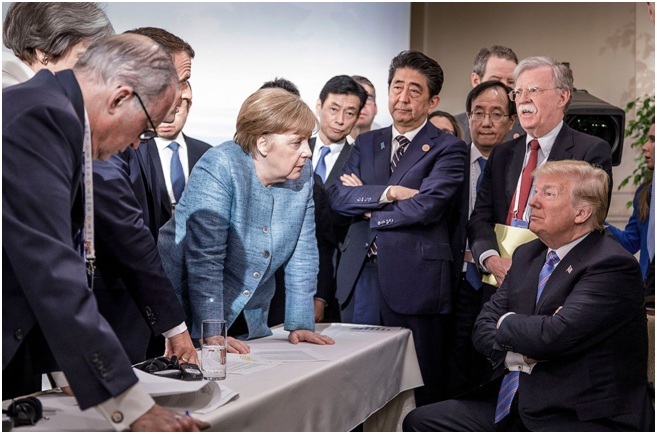 Frankly, Chancellor Merkel does not know how to deal with President Trump. Germany is making moves on the military front. The shift in Germany’s defense thinking is significant. It is in response to the matching blows of Vladimir Putin’s aggressiveness and President Donald Trump’s questioning of the advantage of NATO. President Trump has intimated that the United States might refuse to protect members that fail to meet the NATO defense spending target of 2 percent of GDP. Germany is almost forced to focus more of its attention on defense. German Chancellor Angela Merkel joined French President Emmanuel Macron in calling for a European army two weeks ago, accentuating that such a military would be an accompaniment to NATO, not stand in resistance to it. The trend is now certain, Germany and much of Europe will now look to securing itself militarily and will rely less and less on American help. In the not too distant future-we are told that political chaos in Europe (Revelation 17), will lead to a newly formed confederation of states that will be beastlike (terribly destructive). We believe that Germany will play the leading role in the end-time beast system. We are also told in the book of Daniel, that God often removes and sets up leaders according to His purpose and insights: Daniel 2:21- He controls the course of world events; He removes kings and sets up other kings…thus we watch Europe with this in mind, and with intense interest! Now we know the Saudis killed Mr. Khashoggi…but why? To help see through this ongoing international drama, understand that the leaders of Saudi Arabia and Turkey don’t trust each other. The Turks support the Islamist Muslim Brotherhood; the Brotherhood is working to overthrow the Saudi Royal Family. Thus, the Saudi leadership view the Muslim Brotherhood as a great enemy. We must always keep in mind that Saudi Arabia is prophetically significant–We believe Saudi Arabia is home to the descendants of Ishmael: “He (Ishmael) will be a wild donkey of a man; his hand will be against everyone and everyone’s hand against him, and he will live in hostility toward all his brothers.”—Genesis 16:12. That description continues to play out in real time today. So what do we know about the murder? Mr. Khashoggi entered the Saudi consulate in Istanbul to sign papers relating to his marriage and never surfaced again. The Jamal Khashoggi murder mystery has shocked the Western world. But it shouldn’t have; silencing your enemy, and being brutal about it, is the way of the Middle East. 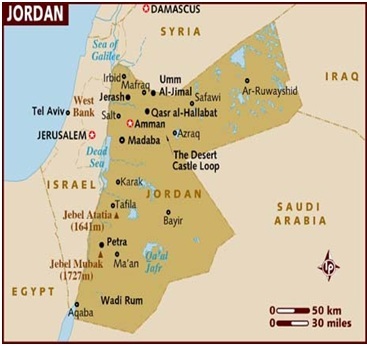 Remember, the prophecy in Genesis regarding the Arab people (this would include Saudi Arabia). 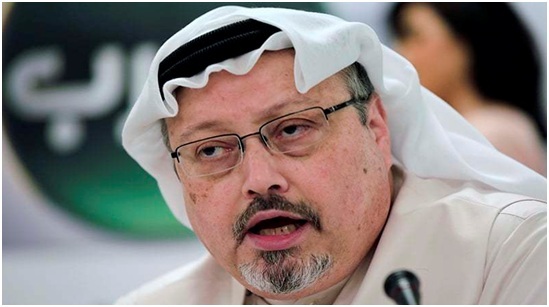 European left leaning media have largely painted Mr. Khashoggi as a liberal journalist who opposed the regime of the self-styled Saudi reformer, Crown Prince Mohammed bin Salman (known as MBS). They say he wasn’t really a reformer at all; so, MBS had Khashoggi killed because Khashoggi was a threat to the Royal Family. What really happened, we may never know—but this is another story coming from Middle East sources…The more likely reason is that Mr.Khashoggi was very much an Islamist connected to the Muslim Brotherhood. It seems, Mr. Khashoggi was intimately connected to the Saudi regime, which is bitterly opposed to the Brotherhood. He was the ultimate insider who had turned–gone rogue—he became a type of spy; feeding the Brotherhood secret information about the Saudi Royal family. His fiancé, is a Turkish diplomat, and is the daughter of a former adviser to Turkey’s Islamist President Recep Tayyip Erdoğan. Khashoggi was planning to start a Turkish center, funded by the Turks and the Qataris, encouraging change in Saudi Arabia to champion rebellion. Middle East sources have been quoted in the U.K. as saying that the Saudis set out to bring Khashoggi back against his will. That’s why they sent the 15-strong squad, who had been alerted to the scheduling of his consular appointment. The goal was to remove him back to Riyadh, interrogate him and lock him up for a period of time, but not to kill him. “If they’d wanted to kill him,” my informant said (U.K. Newspaper said), “they could easily have paid $200,000 to the Chechen mafia in Istanbul who could have taken him out so easily and made it look like a robbery gone wrong. There was no kill order from Saudi Arabia. Khashoggi would have been locked up and interrogated. They wanted to know who he had talked to and what he had revealed. They say some leaks from Qatar had his fingerprints all over them.” They tried to sedate Khashoggi, but that plan broke down, during the sedation process he died. His body had to be destroyed. So it was a bungled kidnapping and not a planned assassination. We may never know if this is true. What we do know is that Saudi Arabia, Turkey, and Iran are all vying for power in the Middle East. It is tribe against tribe, brother against brother. The killing of Mr. Khashoggi is shocking to the West, but it is the way of the desert. Certain European leaders are saying “NO” to Angela Merkel of Germany regarding her policy of Immigration from the Middle East and North Africa. A new pro-border consensus is budding, which includes Italy, Austria, Hungary, Romania, Poland and others states who are saying no to immigration from the world of Islam. In Revelation 17:12 we are told that in the near future, there will be union of “ten kings [leaders] who have received no kingdom as yet, but they receive authority for one hour [a short time] as kings with the beast. These are of one mind, and they will give their power and authority to the beast” (verses 12-13). The focus of this prophecy is Europe.